Babita Kumari lost to Canada’s Diana Weicker in the Freestyle 53 kg Nordic silver medal match as she went down 5-2 in the final bout. Previously, Babita had to beat the likes of Nigeria’s Bose Samuel, Sri Lanka’s Deepika Dilhani and Carissa Holland to set the fifth and final match against Weicker. Babita started her campaign against Samuel, which she won 3-1. The match started on a slow note for the player as the referee warned her for the passive play that led Samuel to win one point. However, the Indian came back stronger but successfully took down Samuel in the next round to win 2-1. She ended the bout winning 3-1. In her next bout, the Indian came up against Deepika Dilhani of Sri Lanka. After an average start to the event, the onus was on Babita to deliver and that is exactly what she did. In the first period itself, Babita was able to pin her opponent to take maximum points from the bout. It was the same story in the next one as well. The only difference was the opponent, Carissa Holland, who suffered the same fate as Dilhani as she was also pinned down by Babita in the first period. 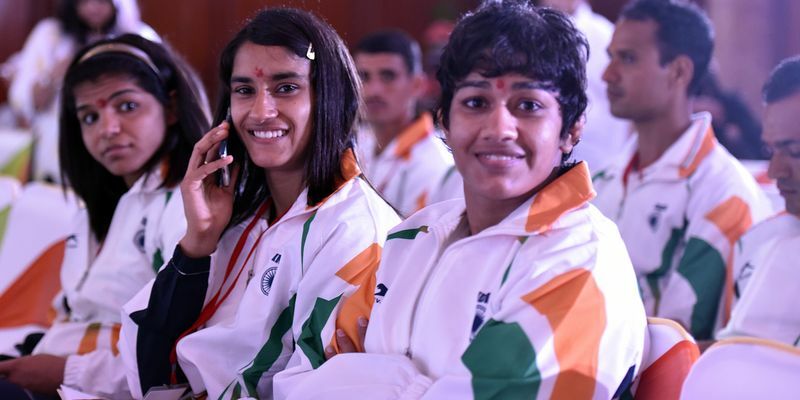 Babita’s results meant that at the end of three bouts, the Indian was at the top of the standings with 13 points. However, the only wrestler that she hadn’t fought, Diana Weicker, was the one who was right behind her with 12 points. This meant that the final bout between the two was going be a virtual Gold medal match. Fighting with Diana was always going to be tricky, which was reflected by the dominance she had shown over the other opponents. Babita started carefully against her and her passive stance led the referee to warn her for passive play. Diana capitalized on it for the next 30 seconds and got a point. Babita had to come back fast and her one-leg attack ended up handing Babita two points and Diana two more. The match was slipping out of Babita’s hand and her urgency led Diana to turn her once again. It was followed by another of Babita’s attempt that the Canadian capitalized to push her out of the ring. Babita lost 5-2 at the end and satisfied with the silver medal.